VICFORESTS' David Walsh says that wood would have gone to waste had the trees killed or severely damaged in the 2009 bushfires not been harvested (''Call for inquiry as salvaged wood exported'', The Age, 20/6). What a profit-at-all-cost mentality. Leaving fire-killed or damaged trees standing is not a waste. They create structure in the regenerating forest, sheltering new growth and providing homes to badly affected wildlife. Leadbeater's possum, for example, will rely on the protection provided by the hollows created in these trees to recover their populations over the ensuing years. And these trees will continue to store the carbon they have absorbed from the atmosphere for years to come. We all enjoy the benefits of a healthy natural environment, even though it is not always recognised by some as an economic benefit. THE Ombudsman has been asked to investigate VicForests for allowing thousands of tonnes of wood salvaged from the Black Saturday bushfires to be exported to China in breach of a government contract. The Wilderness Society has lodged a complaint with Ombudsman George Brouwer after VicForests confirmed a private company, Pinex Logging, had breached a contract to process the logs locally to protect jobs in the Victorian timber industry. VicForests initially agreed to supply the company with 145,000 tonnes of logs to process in Victoria, an amount that was later cut to 50,000 tonnes. A VicForests statement provided to The Age reveals VicForests has now suspended supplying logs to the company while it investigates how the breach occurred. The statement said the company was initially meeting contractual requirements for local processing. 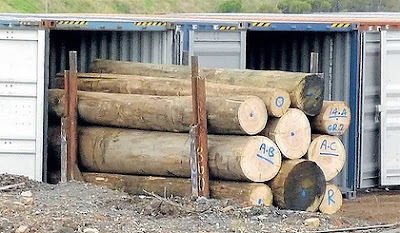 The Wilderness Society revealed tens of thousands of tonnes of hardwood logs were being loaded into shipping containers at a log yard in Melbourne's west and sent to China. Wilderness Society campaigns manager Richard Hughes said an independent investigation was needed as ''VicForests has a serious conflict of interest in this matter''. ''VicForests sold the logs to the exporter for at least $3.5 million so they have profited from this venture and if it is stopped they will miss out on future timber royalties, adding to their current major financial problems,'' Mr Hughes said. Mr Hughes said he found it difficult to believe VicForests was unaware the company was breaching the contract because it pays and directs the trucking contractors who have been delivering the timber to the export yard, where there are no timber processing facilities. ''It's not appropriate to have VicForests leading this investigation - they are are not an independent regulator, and there are grounds to suspect they have either been complicit in the export operation or negligent in not stopping it earlier,'' Mr Hughes said. A spokeswoman for the Ombudsman would not comment on whether the issue would be the subject of an investigation. VicForests spokesman David Walsh said the wood would have gone to waste had the trees killed or severely damaged in the 2009 bushfires not been harvested. Redd Forests Pty Ltd has written to Forestry Tasmania suggesting it adopt the "commercially proven" model. The company's Tasmanian-based project manager, Jarrah Vercoe, said Redd Forests had made $450,000 by selling just under 30,000ha of privately owned native forest to international carbon buyers. Mr Vercoe said, unlike native forest woodchips, there was a growing demand for carbon credits. "Based on the value of recent carbon credit sales and conservative figures on timber volumes, our proposition is that Tasmania can generate in excess of $50 million per annum from these avoided emissions," he said. "This works, it is proven. We could do this tomorrow." Redd Forests was incorporated in NSW in 2008 and has Chickenfeed owner Jan Cameron as a non-executive director. Forestry Tasmania spokesman Ken Jeffreys said FT believed the carbon offset plan would deliver less money and employ fewer people than the existing timber industry. "Last year alone, the final value of products produced from these forests was $563 million and kept about 3400 people employed," Mr Jeffreys said. Premier Lara Giddings said getting benefits from carbon was a key part of the forestry peace talks' Statement of Principles and the Government would consider creating new reserves for this purpose. But the Premier said she did not believe Redd Forests' proposal was in the best interests of the state because it failed to acknowledge the thousands currently employed in the Tasmanian forestry industry. Harvested from Victoria's bushfire-damaged native forests, these valuable logs have been stored in a Brooklyn timber yard. A TIMBER merchant has been accused of putting Victorian jobs at risk by sending thousands of tonnes of wood salvaged after the deadly Black Saturday fires overseas for processing. The state government's commercial forestry arm, VicForests, confirmed yesterday it was investigating Robert Brudenell, of Pinex Logging, over a suspected breach of contract. VicForests initially agreed to supply Mr Brudenell 145,000 tonnes of bushfire-affected timber on its standard contract condition that the logs be processed in Victoria to protect the state's timber industry, which is battling softening demand from manufacturing and construction, and the high Australian dollar. VicForests spokesman David Walsh said yesterday Mr Brudenell's contract had been slashed to fewer than 50,000 tonnes by ''mutual agreement''. Mr Walsh declined to reveal the exact reason why the contract was reduced, citing confidentiality. Mr Brudenell could not be reached for comment. He will be asked to prove that he is processing the logs in Victoria when he faces representatives from VicForests on Tuesday. Mr Walsh said VicForests received evidence of a potential contract breach on Thursday after having earlier visited Mr Brudenell's operations. The logs have been sawed to length in a timber yard behind a woolshed in Brooklyn before being loaded into shipping containers. Wilderness Society spokesman Richard Hughes claimed Mr Brudenell was shipping the logs overseas, probably to China. ''To have thousands of tonnes of logs out of native forests being exported is a disaster for the environment, it's a disaster for the timber industry and jobs, and it's a disaster for the local communities,'' he said. Under VicForests' contract rules, timber harvested from native forests must be processed in Victoria by being peeled, sliced, chipped or sawed on four sides. The timber supplied to Mr Brudenell is for high-end use, such as quality laminate timber for furniture or flooring, which attracts a high price. If he is found to have breached his contract, VicForests will cease supply to Mr Brudenell. Mr Walsh said the 50,000 tonnes supplied represents 2 per cent of VicForests' annual production. He said the wood would have otherwise been left to rot, from trees that were killed or severely damaged by the 2009 fires. ''These operations have taken place in approximately 3000 hectares of the 400,000 hectares burnt by the fires,'' he said.